3M is developing a new optical film that lets you view 3D images on a mobile phone or mobile device, without the need for using 3D specs. While the image is technically stereoscopic, the special overlay means you can ditch the specs and not look like a right royal plonker when playing games on the Tube. 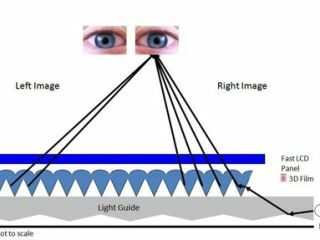 The new optical film goes into your phone's backlight unit, using two rows of LED lights to project left and right images one after the other into your eyes. The tech focuses on each eye, meaning that there would be no need for the viewer to wear unsightly 3D glasses, as with traditional 3D technology. Erik Jostes, LCD business director of 3M's Optical Systems Division, noted that the tech "can switch from 3D mode to 2D mode and back and you don't make compromises on the original display". Just as with 3D ready TVs and PC monitors, 3M's new 3D mobile screen technology works at a 120Hz refresh rate and will work on screens up to 9 inches wide, with the company looking towards the games industry in particular to develop mobile entertainment content to really show off the tech. The new 3D film from 3M will be unveiled to the public at the Korea Electronics Show next week.